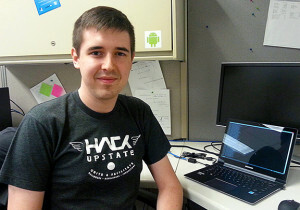 Carter Yagemann, a senior in the computer science program from Jupiter, Fla., spent his summer crawling the Android operating system as part of the Department of Electrical Engineering and Computer Science’s Research Experience for Undergraduates (REU) program. Carter investigated Android security using “an intent firewall” to protect user’s information on smartphones and tablets. Q: How did you learn about the REU program? A: I was actually a student in one of Professor (Kevin) Du’s classes and I had been doing internships in the private sector. I started as a web developer for Frontier Communications and then I worked for JPMorgan Chase in some of their security areas. I wanted to gain as much exposure as I could, so I was interested in getting into research. I approached Professor Du and he gave me an offer to do research under him. Q: What has this experience been like? A:It’s been a lot of fun. It’s been nice to pursue what I’m interested in. There’s a lot less red tape and hurdles when you’re doing research versus in the private sector where there is a lot of regulation and accountability. It was really fun, really educational. I get to be with my peers, people more my age. I can mostly do what I want. Q: Why did you choose to come to Syracuse University? A: I was choosing between here and Drexel University and I wasn’t sure that I wanted to be in a big city like Philadelphia. I picked Syracuse because there’s a nice atmosphere here. It’s a condensed campus, and there’s a lot going on. It’s a nice place to be. Q: What do you plan to do with your degree in computer science after you graduate? A: I definitely want to continue to pursue cybersecurity. Right now I am looking in multiple places. I’m looking at what’s going on out in Silicon Valley and what’s going on with the government. I just want to go where the interesting work is–something I haven’t seen before. I’m really open. Part of the point of this research was to try to find where I’m happiest. The Department of Electrical Engineering and Computer Science hosted its annual REU program this summer. It culminated with a half-day of presentations in July in which seven REU students from four different universities, including SU, Cornell, SUNY Fredonia and the University of Illinois at Urbana-Champaign, completed research on a range of topics.